If you had a half cyber body, would you dedicate your life to being a digital detective? This unique premise is explored in Digimon Story Cyber Sleuth, but it's not your average story about hackers and detectives because it's a Digimon game. While other Digimon games keep collecting Digimon as the core gameplay mechanic, Digimon Story Cyber Sleuth focuses on the story of the half digital protagonist and the many adventures had uncovering the truth about the Digital World. But don't fret, as this turn-based JRPG boasts killer gameplay, a decent story and it's the most fun I've had evolving creatures in a game in years. Cyber Sleuth's story is set in a world where it's commonplace for everyone to have a Digivice. Digivices allow people to log onto the Digital World of EDEN where they can interact with friends as if they're face to face. It's in the world of EDEN the protagonist and friends become hackers by chance when their Digivices are hacked and gain the ability to summon Digimon using the Digimon Capture program. It seems like a good chance encounter at first, but the world of EDEN isn't perfect as the friends get attacked by an Eater, a murderous data eating program that can cause serious problems for them inside the Digital World and the real world for some reason. They survive the attack by logging out, but the protagonist is left with a pretty significant scar - a half digital body. This half digital body can travel through wires and explore hidden servers, meaning the Protagonist is the perfect person to explore the mysterious surrounding EDEN and Digimon and the journey of the Cyber Sleuth begins. 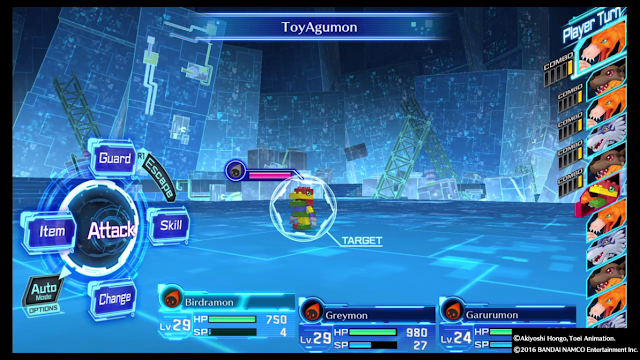 The Protagonist's journey is not only aided by the Cyber Sleuth ability, but also the power to use Digimon. After you choose your first Digimon, you can begin catching and battling the 200+ Digimon available to catch and battle with. Pretty much every Digimon you encounter is able to be caught and battled with and once you've seen a Digimon enough times, you can load its data in the Digilab and make it your own. I was pleased to see the Digimon all had the same ability names and Digivolutions as the TV show and every one of my favourite Digimon from the three Digimon series I watched as a kid were available to capture and play with. These Digimon battle in Cyber Sleuth's easy to follow turn-based battle system, which pretty similar to the turn-based battle system featured in other games I've played such as Final Fantasy X or Conception II. Capturing the Digimon is the just the beginning of the fun. Not only can you capture all the Digimon, but you can Digivolve and De-Digivolve them as much as you'd like. 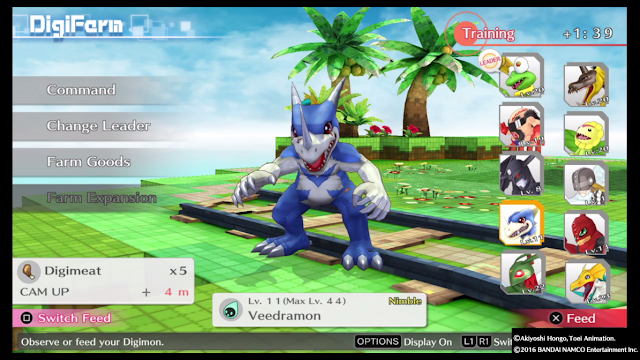 Cyber Sleuth occasionally blocks you from going to some areas unless you have a certain level of Digimon, but what's really cool is while the Digimon you can capture are usually lower level, after training them enough there's no barrier on when you can Digivolve to most higher evolution Digimon, other than fulfilling their requirements. Very few Digimon are blocked off until later parts of the game, which made me feel like I had a lot of freedom to do what I wanted to with my Digimon. It's always exciting to build a team of cool monsters and this system made it seem achievable to get the party I wanted. Training and collecting Digimon is only a portion of Digimon Story Cyber Sleuth, as it also packs in a 30+ hour story as well. The story explores the protagonists journey as a hacker detective with a half cyber body, which is already an interesting premise. Combined with Cyber Sleuth's amusing characters such as Nokia and Kyoko, the story and its main quests do a pretty good job at being entertaining and exploring many different themes such as human consciousness, mysteries and the prospects of what it could be like to having a deep digital world, which are pretty serious for a series that was originally a kids TV Show. I felt like the story was the most interesting towards the beginning and end chapters, but lacked some substance in the middle. While the middle chapters featured a lot a good story developments that were essential for the ending, they felt like they either dragged on in some places or brushed over interesting plot points in others. There are opportunities to explore the plot deeper by using the side quests, which did help me get more enjoyment out of the story, but I feel like either condensing chapters or adding more exciting details could have made the story feel more like a great story than just a good one. The story is good enough though and the casts of Human and Digimon characters are all very interesting and boast very desires and humour. 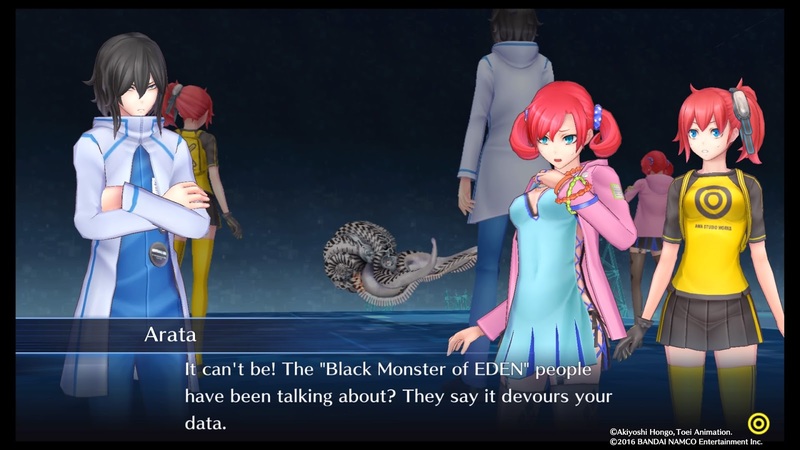 A big positive to the story though is the world that Cyber Sleuth is set in. The story is set in a mix of the Digital World and modern day Tokyo. The Digital World looks bright and very open and the use of colour gives each area in the world of EDEN an appropriate feeling, such as the public areas using bright whites and neons, while areas where hacker groups go feature deep blues and greens. Meanwhile, the real world features popular areas in Tokyo, such as Akihabara, Nakano and Shinjuku. 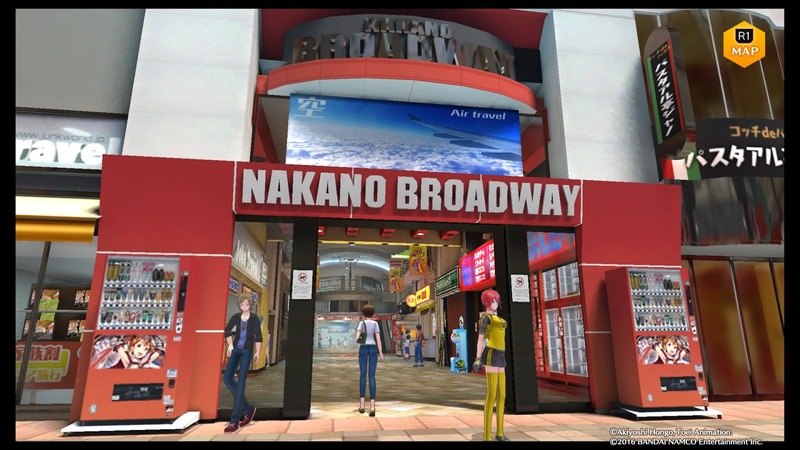 Cyber Sleuth does a superb job replicating these areas, even with many popular buildings such as the Sega Arcade in Akihabara being present and very close to what it looks like in real life. I actually visited Nakano recently, and was pretty flabbergasted at the details included, such as identical signs and store details. These well-done areas make the world of Cyber Sleuth much more immersive and it's a great representation of Tokyo. 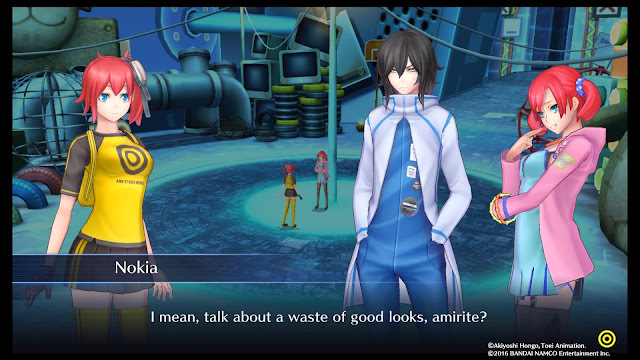 Outside of Digimon Story Cyber Sleuth's main story and gameplay, there are plenty of ways to spend your time in the game. There are world-building side quests that allow you to get to know weird and wonderful humans and Digimon, along with winning useful items. Aside from quests, there are Medals to collect for bonus in-game yen, an offline arcade tournament to win with your Digimon, an online mode where you can verse other Cyber Sleuth players with your Digimon and even Digifarms to look after where you can train your army of Digimon or get them to farm for items and quests. Also, throughout the game you regularly receive texts from your human friends and Digimon that you keep in your Digifarm. I remember being incredibly excited when I got my first text from a Digimon and most of the messages do a good job at not repeating themselves, at least until you've played the game for awhile. I love the idea that your Digimon are thinking of you and they send a variety of messages, from compliments, to tidbits about their day and even quizzes. 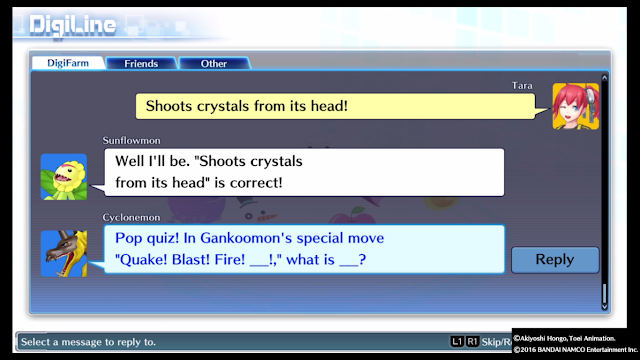 While I thoroughly enjoyed Digimon Story Cyber Sleuth, it is worth mentioning that the game does suffer from some localisation errors that break the immersion sometimes. It wouldn't be a problem or worth mentioning if it was just a couple of times and while the game definitely is closer to a good localisation than it isn't, there were enough strange conversation choices, spelling and grammar errors for me to notice it. I also had difficulty at one point trying to get a certain Sleuth Skill due a translation inconsistency that I had to Google, which makes it feel like it may not have been proofread as much as it needed to be. I do hope these errors get fixed in patches in future, but it's unfortunate they were present in the initial release. With a stellar monster collection and a decent story, Digimon Story Cyber Sleuth presents a unique world to explore, using a fantastically realised Tokyo replica and an interesting digital world filled with amusing characters. Combining an easy to understand turn-based system with deep monster collection and interaction, a great Digivolution system and with plenty to do before and after the story, Cyber Sleuth is great for lovers of the anime series or JRPG fans who enjoyed the old Digimon World games. It's ignited a weird monster collector part of me I forgot I had and I'm looking forward to seeing just how many powerful Digimon I can Digivolve to in New Game+. I can't wait to get more Mega Digimon in the end game and watch Nokia's funny antics for a second. Worth checking out if you're a fan of training an army of creatures! 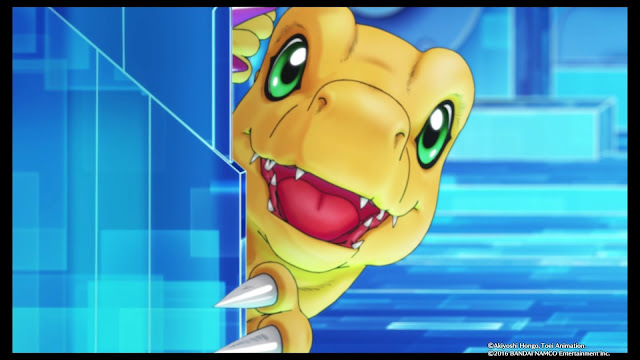 Want to read more about my love for Digimon Story Cyber Sleuth's Digivolution mechanic? Check out my last article! Note: This article contains affiliate links to Play-Asia to help support this site and to help you find the games mentioned in this article. You can read our Affiliate Link Policy here.